The Studio was one of the most respected and influential art journals published in Britain. 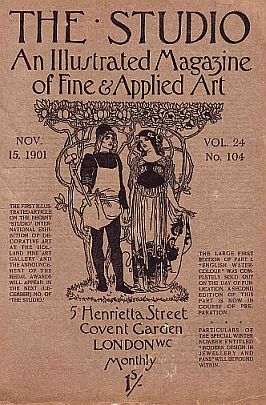 It was international in its coverage, and contained, long, often well-illustrated, articles on all aspects of the decorative, fine and applied arts. It included contributions from many of the leading art critics of the day, e.g. Aymer Vallance, Walter Crane, Fernand Knopff and A. Lys Baldry. Each issue of The Studio also contained a round-up of the latest art news, reports on recent exhibitions, and book reviews. The Studio played an important role in promoting trends and developments in contemporary art and was largely responsible for establishing the reputations of many artists notably Aubrey Beardsley, James McNeill Whistler, and the artists of the Glasgow School. It was also significant in promoting the Arts and Crafts movement in Britain. The success of The Studio led to the launch of similar journals elsewhere in Europe, including Deutsche Kunst und Dekoration in Germany (founded 1897), and Art et Décoration in France (founded in 1897).